Whatever your passion – a cutting edge adventure or a weekend of relaxation – Vortex is the ideal choice to complement your lifestyle. 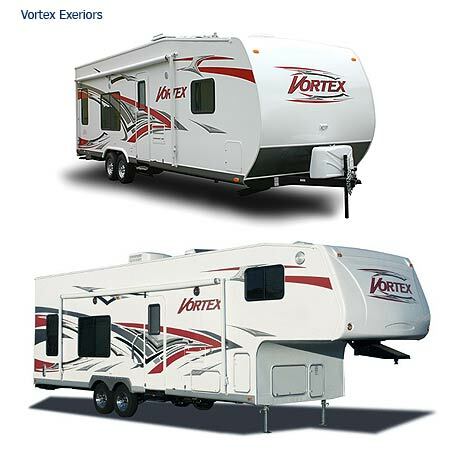 The aluminum framed, laminated Vortex includes such standard features as a built in 4,000 watt Onan Generator, LCD flat screen T.V., 100 gallons of fresh water capacity, convection oven, 40 gallon fueling station, 7 ft. ramp door, and a 2” fully insulated decked floor. In addition, the standard “Camp in Comfort” package also includes a pressure washer, 13.5 A/C, awning, high intensity lights with Door-side dimmer switch, outside speakers, and upgraded cherry wood cabinetry. Dynamic exterior graphics and Stylish interior decors complete this impressive toy hauler.